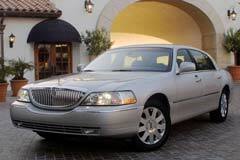 Ford's used Lincoln Town Car was a full size 4-door luxury vehicle that was sold starting in 1981 to 2011. This luxury vehicle featured a V8 engine, body-on-frame design, and rear-wheel drive. Its large interior and exterior dimensions were based on Ford's Panther platform. It gave the suspension and power train commonality with Ford's LTD Crown Victoria, as well as Mercury's Grand Marquis. Their design made them very durable in rough conditions which made them easier and cheaper to fix.